This article covers POISONOUS plants. Although some poisonous plants have other uses, they can cause irritation by simply handling the plant. It is extremely important to acquire the necessary knowledge for proper plant identification. Always read several sources and preferably seek professional assistance. Improper handling of poisonous plants can cause symptoms that can range from dermatitis to death. Lets cover the plants that are poisonous. 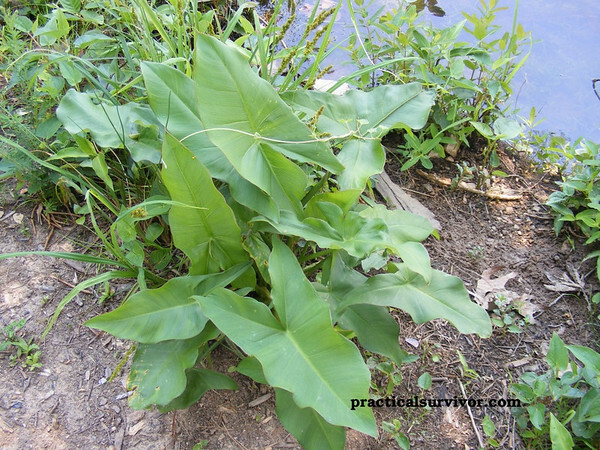 Some poisonous plants have other uses such as bug repellent and to repel animals. 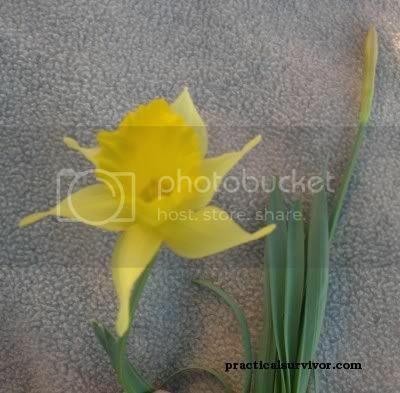 Daffodil - (narcissus) - The yellow flower has six leaves with a cup like flower in the middle. The green leaves are flat. 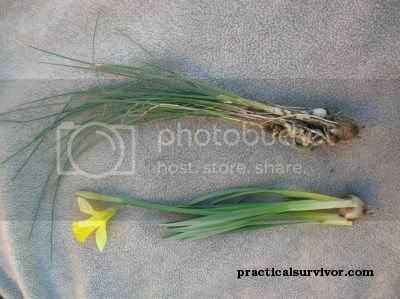 The picture below allows some comparison between wild onion and daffodil. Notice the leaves on the wild onion/garlic are round & hollow, the leaves on the daffodils are flat and thick. 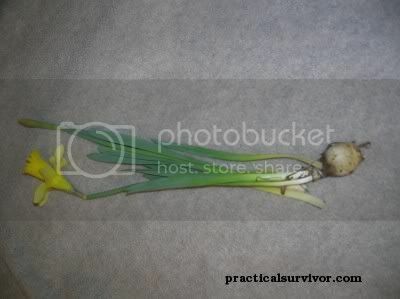 Wild onion and garlic have a distinct smell when you pull them out of the ground and when you cut the leaves. Although the daffodil has an onion-like bulb, do not make the mistake of eating this plant. Handling of the plant can cause dermatitis to some individuals. Green Arrow Arum - (Peltandra virginica) - Mistaken for the edible Broadleaf Arrowhead or Duck Potato. This plant is very toxic. High levels of calcium oxylate If eaten it feels like needles are in your mouth and going down your stomach. Causes vomiting, sweat, increased heart rate, and diarrhea. Some claim that cooking or drying the plant would make it edible. We boiled it for 20 minutes and it still made me very ill.